1کارشناسی ارشد، دانشکده روان شناسی و علوم تربیتی، واحد خمین، دانشگاه آزاد اسلامی، خمین، ایران. 2دانشیار، گروه مشاوره، واحد خمین، دانشگاه آزاد اسلامی، خمین، ایران. مقدمه: یکی از پدیده‌هایی که فرایندهای ارتباطی درون خانوادگی را تحت تأثیر قرار داده، ظهور اینترنت است. بر این اساس، هدف پژوهش حاضر بررسی رابطه بین اعتیاد به اینترنت با رضایت و دلزدگی زناشویی دانشجویان متأهل دانشگاه آزاد اسلامی خمینی‌شهر بود. مواد و روش‌ها: روش پژوهش حاضر، توصیفی بود. جامعه آماری را کلیه دانشجویان متأهل دانشگاه آزاد خمینی‌شهر در سال 1394 تشکیل می‌دادند. حجم نمونه 380 نفر (242 زن و 138 مرد) بود. گروه نمونه با استفاده از روش نمونه‌گیری تصادفی طبقه‌ای، از دانشجویان متأهل مرد و زن دانشکده‌های دانشگاه خمینی‌شهر انتخاب شدند. ابزارهای پژوهش به ترتیب مقیاس اعتیاد به اینترنت یانگ، پرسشنامه دلزدگی زناشویی پاینز و مقیاس رضایت زناشویی گراهام بی اسپنیر بود. برای تحلیل داده‌ها از همبستگی پیرسون با در نظر گرفتن سطح خطای 05/0 استفاده شد. یافته‌ها: میانگین و انحراف معیار سن شرکت‌کنندگان 62/3 ± 4/25 سال بود. تحلیل نتایج بیانگر این بود که بین اعتیاد به اینترنت دانشجویان متأهل با رضایت زناشویی رابطه معنی­دار منفی (87/0- =r، 001/0>p) و با دلزدگی زناشویی (75/0=r، 001/0>p) رابطه معنی­دار مثبت وجود دارد. نتیجه‌گیری: بر اساس یافته‌های حاصل از پژوهش به نظر می‌رسد استفاده خارج از میزان به هنجار از اینترنت، رضایت زناشویی را تحت تأثیر منفی قرار داده و یکی از دلایل دلزدگی زناشویی می‌باشد. 1MSc, Psychology and Educational Sciences Faculty, Islamic Azad University, Khomein Branch, Khomein, Iran. 2Associate Prof, Dept of consulting Psychology and Educational Sciences Faculty, Islamic Azad University, Khomein Branch, Khomein, Iran. 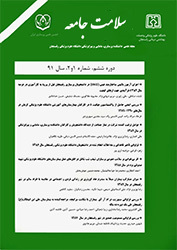 Introduction: Nowadays, rapid growth in the internet technology has strongly affected the communicational processes particularly intra-family communication .The present study was aimed to investigate the relationship between internet addiction and marital disaffection and satisfaction in married students of Islamic Azad University, Khomeini Shahr Branch. Material and Methods: In this descriptive study, 380 married students (242 females and 138 males) were included using stratified random sampling method. The data gathering tools were Yang’s internet addiction scale, Painz’s marital disaffection questionnaire and Graham B Spenir’s marital satisfaction scale. Pearson correlation was applied for the data analysis at 0.05 error level. Results: The mean age of the participants was 25.4±3.62 (SD) years. While a negative significant association was observed between the internet addiction rate and marital satisfaction i (-0.87, p= 0.001) this association was positive for disaffection status (p<0.001, r=0.75). Conclusion: According to the findings of this study, unusual usage of internet may have an adverse effect on marital relationship. Ofovwe C, Ofili A, Ojetu O, Okosun F. Marital satisfaction, job satisfaction and psychological health of secondary school teachers in Nigeria. Health 2013;5(4):663-8. Pines AM. The female entrepreneur: Burnout treated using a psychodynamic existential approach. Clinical Case Studies 2002;1(2):170-80. Ghasemi V, Malekahmmadi H. The description of internet addiction among Shahin shahr caffe netusers. Communication research 2010; 17(4): 51-77. [Persian]. Young K. Internet addiction: diagnosis and treatment considerations. Journal of Contemporary Psychotherapy 2009;39(4):241-6. Luciana RP. One minute more: Adolescent addiction for virtual world. Procedia-Social and Behavioral Sciences 2010;2(2):3706-10. Kim K, Ryu E, Chon M-Y, Yeun E-J, Choi S-Y, Seo J-S, et al. Internet addiction in Korean adolescents and its relation to depression and suicidal ideation: a questionnaire survey. IJNS 2006;43(2):185-92. Krejcie RV, Morgan DW. Determining sample size for research activities. EPM 1970;30(3):607-10. Bradbury TN, Fincham FD, Beach SR. Research on the nature and determinants of marital satisfaction: A decade in review. JMF 2000;62(4):964-80. Pines AM, Nunes R. The relationship between career and couple burnout: Implications for career and couple counseling. JEC 2003;40(2):50-64. Ko C-H, Yen J-Y, Chen C-C, Chen S-H, Yen C-F. Gender differences and related factors affecting online gaming addiction among Taiwanese adolescents. The JNMD 2005;193(4):273-7. Anderson KJ. Internet use among college students: An exploratory study. JAC 2001;50(1):21-6.